Then we have Reduced Borrowing and Lending, as consumers are paying down debt and banks are reducing their lending. Both are necessary in a credit crisis-caused recession. Bank lending is basically back to where it was two years ago, and shows no sign off rebounding. Banks, as I have written, are buying US government debt in an effort to shore up their balance sheets. Lending to small business, the real engine of job creation, is sadly decreasing eachmonth. 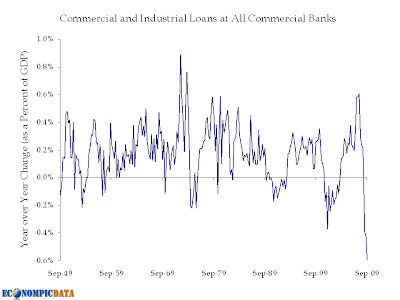 The chart below shows the year over year change in business loans as a percent of GDP going back 60 years. A record drop and this one doesn’t yet appear to be slowing down.